Talk of love and brotherhood is about to begin in earnest as Christians the world over commemorate a gentle soul born in a manger and famous for uttering such lines as “just as you did for the least of these, you did for me” and “if someone slaps you on one cheek, offer the other cheek also.” These are powerful words with pretty clear meanings. Yet, many a battle has been started and fought by those who profess to follow these teachings. Plenty of other wars are fought by followers of other gentle faiths, whose prophets and leaders and books of wisdom offer similar, clear admonishments to love one another. According to Professors Mark Harrison from the University of Warwick and Nikolaus Wolf from Humboldt University Harrison this increase can be explained in part by the proliferation of borders. In other words, the number of countries has almost quadrupled since 1870, giving us more countries to fight each other and more borders to fight about. Because we can. How can an entire species profess to love the concept of peace, and yet continue to fight more as time goes on? It looks like we do merely because we have more things to fight over and more things to fight with. Funny how things come at you clumps. One day its cute kittens every place you look, the next day its information on vitamin supplements. Yesterday, I had a “peace” day. Signs were everywhere. And many of them were on Facebook. One of the joys of creating a Facebook page for my collection of novels 46. 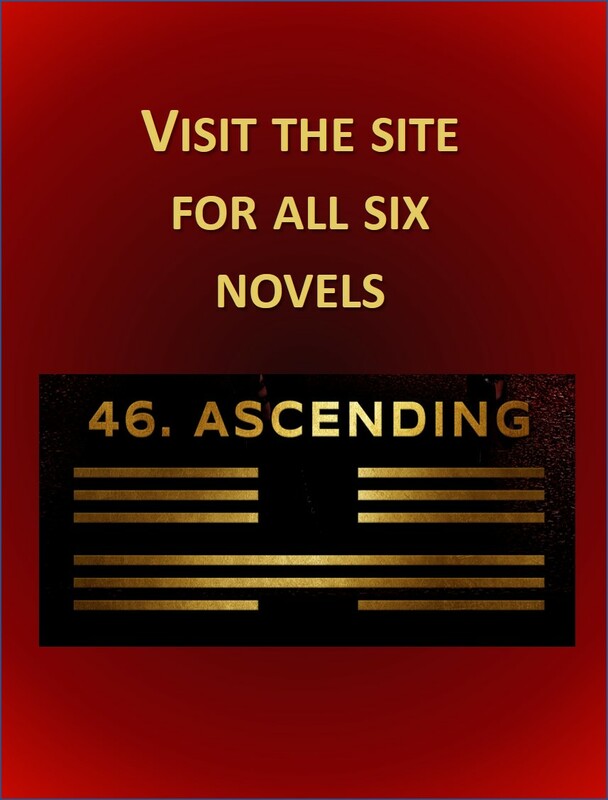 Ascending has been the way it has given me reason to seek out other people’s pages and to share some of my favorite finds. I’m not sure what the exact etiquette is on sharing posts from the Facebook world on ones blog, so I will ask you to please drop by the wonderful page called Hippie Peace Freaks and kindly give them a like while you are there. There is no better place for peace signs than the Facebook page of the amazing Dalai Lama, who happily shares his wisdom with those of any faith (or none). Please consider liking his page as well. There may not be anyone more likable on the planet. I am also impressed with much about the new Pope Francis and share this from his Facebook page. He doesn’t have his staff working on powerful imagery to go with his thoughts (yet) but these are thoughts worth liking. Finally, a huge LIKE to the people who get out there and do something to promote world peace. Please visit the page for Peace One Day, where you can view this photo of a meditation flash mob at the Brandenburg Gate in Berlin, Germany. A meditation flash mob may sound like an oxymoron, but these participants took off their shoes and meditated for an hour to promote mindfulness and peace in the world. Do such actions make a difference? Do photos of such actions make a difference? I think we all change just a little when we start to see peace signs everywhere we look. For more of my favorite signs of peace, please drop by my Facebook page Number 46. Ascending, and look around as well. I’m learning to meld my blog world and my facebook world into one persona and it is a fun process. Here I think about empathy and telepathy and the implications for both on violence and war. Under what circumstances could you shoot another human if you could feel their fear? Know their thoughts? Lola, hero of x0, needs answers to this question, and her issues fuel my speculation here. Facebook is more of a sales tool, frankly, where I and 1.2 billion other people jump up and down and shout “Look at me.” Luckily, some of the people doing the shouting bother to yell interesting things that can be passed along, even on a blog that likes to reflect on world peace. 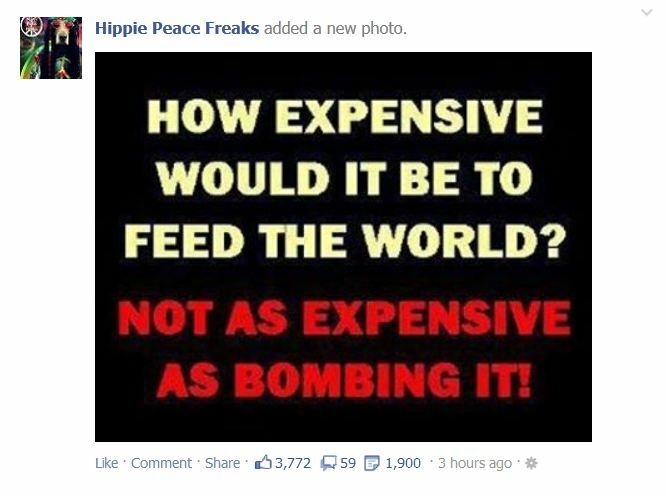 Please consider checking out a fun Facebook page called Hippie Peace Freaks where you can find gems like these and a lot of other fun as well.